Canadian Wildlife Federation: We noticed a wild rabbit in our yard and would like to put out carrots and fruit for him but wonder if that’s the right thing to do? We generally do not recommend feeding wild mammals. It can often lead to problems for them as they very quickly adapt to humans and become reliant on your hospitality. Putting out vegetables and fruits could also attract other less desirable animals thereby creating problems for you. The best way to entice rabbits and other wildlife to your garden is to create a welcoming environment by including aspects of their natural habitat in your yard. 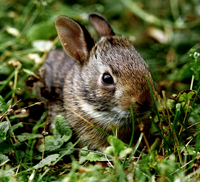 Rabbits prefer woody and shrubby areas on the border areas of woodlots. If you would like to increase shelter for rabbits you can easily add a brush pile. You can also plant more shrubs if necessary. In the summer rabbits eat mostly grasses and weeds, such as goldenrod, wild strawberries, dandelions, and clover. To provide food for them, don’t cut your lawn too short, allow some weeds to grow, and let a corner of your garden go a bit wild with longer grass, weeds and/or wildflowers. In winter, rabbits turn to the bark, twigs, and buds of shrubs and young trees. In fact, they can do a lot of damage to your garden. If you’re worried about any particular plants, you can protect them with hardware cloth or chicken wire. To provide rabbits with a winter food source, place any branch trimmings from fall pruning on the ground for them.